This game was a special one for right wing / center Daniel Briere, his first game playing against his old team, in his new city where his fans adore him. He didn't play his best, with zero points and shots and four penalty minutes in the game, but emotions were probably stirred playing to defeat his former teammates. Early in the game the Flyers had the momentum, but two back two back, slightly overlapping penalties for Philly leads to a huge momentum swing to the Habs players. 8:10 into the first period, the Flyers have a massive difficulty keeping the puck on their sticks and getting it out of the zone, along with hard work by Les Canadiens, and Brian Gionta taps in the first goal of the game. Goal assisted by Bourque and Plekanec, but in that play, almost every Canadiens player touched the puck consecutively before Gionta finished the play with a nice celly and drive by the bench. Right as the Habs started to really turn their game up a notch, Raphael Diaz gets a holding call and he's in the box for two minutes. This was a big point in the game, if the Flyers scored there then it could be a tight night with a random winner. But Montreal's penalty kill stands on their heads, successfully killing the penalty. Goaltender Carey Price used to struggle on the penalty kill, but he stepped it up the entire game, and especially during this particular kill, where he robbed newly acquired Vincent Lecavalier twice in a row. A little later both teams have their special teams on the ice, this time for some four on four action! 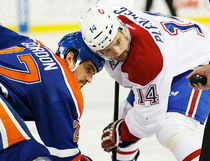 But of course, your Canadiens dominated even then, playing Philadelphia as if they were on a penalty kill! They slowed the game down, and did a spectacular job of circulating the puck and the action as well as getting many shots on goal. This forward momentum for Montreal continues even down to the three minute mark, where Brandon Prust has a perfectly placed, opportune chances but just fades on it. The Canadiens continue this offensive power until the end of the first period, where they lead, 1-0. Peter Laviolette talked some hockey into his boys during the first intermission, because when they came out for the start of the second they came out flying. They seemed like they would get a goal for sure, and when Diaz gets his second penalty of the night, hope seems lost for the Canadiens. But once again, the penalty killing team stands tall, and Price holds his ground and doesn't budge. Philly gets a total of zero shots on goal during that power play. Five minutes into the period, the Habs chances are only getting better. Grossman gets a penalty and the Habs will go on a power play, where they get three great chances only one minute into the power play. Minutes later, Gallagher gets goaltender interference but after some discussion Ray Emery is given a embellishment penalty as well, so we're back to four on four. Not much activity followed that, with momentum evened out and shots 15-18 Montreal advantage, anything could happen in the third period. As if Lars Eller hadn't scored enough in the first game of the season against the Leafs, the Swedish forward scores a great goal 12 seconds in off a rewarding play by Gallagher and Galchenyuk. Briere gets his second hook of the night 1:22 into the final period, and penalty killers for the Canadiens do a great job of wasting time and clearing the puck, playing a strong, positional game against a Philadelphia team that just realized it was now or never. Following that successful kill, Lars Eller draws another penalty, and soon it's a five on three for Montreal. Great chances from that special teamed play continues and eventually P.K. Subban blasts one home! Or at least as fans, players, and even referees thought until they found the puck in the outside on the netting, so it goes under review where it's declared no goal, the puck never entered the net, just got hidden in the outside netting. That doesn't hold him back from giving American born Alex Galchenyuk a great slap pass on the side on the net, that he dissed over to Gallagher on the open part of the net where he taps it in easy, 3-0! Only eight minutes into the period, the Habs have eight shots, and two goals, making it a 4-1 shot/goal ratio for the third period so far. But Josh Gorges take a non-sense penalty a couple minutes after and after Price makes three great saves Lecavalier manages to put one past him, 3-1. A couple minutes later, emotions are getting messed up within the hearts of Philly players, and Schenn takes on Travis Moen just to get the life beaten out of him in the end of the short lived fight. A few plays later, Wayne Simmonds and Ryan White go at it in yet another short lived fight, this time White loses and edge and gets body slammed by the massive body. But the Habs stay true to their game, and continue to get pure chances, laying every shot possible on net. With five minutes remaining in the game, Habs have five more shots than the Flyers in the period, for a total of 7-12. With two minutes left the Flyers started to really pick it up but yet again Philadelphia takes an undisciplined call, this time a high stick by Scott Hartnell on Andrei Markov. Habs still on the power play with 57 seconds left when Eller feeds Brain Gionta a beautiful cross ice, neutral zone backhand, The Canadiens Captain then fakes a slapshot before setting up Rene Bourque who buried the one timer under the arm of Ray Emery, and that would be the end of the game. From Montreal, it's a 4-1 final. This game was the first regular season for many new Canadiens, including Danny Breire from Philly, and enforcer George Parros! Briere had a decent debut, with a -1 +/- rating, 2 penalty minutes, and 4 well placed shots. Enforcer George Parros had a rough night, only playing 4 minutes on the ice, yet he had 20 penalty minutes! These minimal minutes were due to him in his second fight against Colton Orr, getting pulled down after he got Orr down, and smashing his face onto the ice head first. It was a tragic scene at the Bell Centre, and he was taken off the ice on a stretcher, later taken to the hospital via ambulance where he was diagnosed with a concussion. He is currently placed on the Injury Reserve and is out indefinitely. More information on his status will come out when it is released. The Habs fought hard the entire game, some more literal then others. Travis Moen had 7 penalty minutes, including one fighting major versus Mark Fraser and a equipment interference when both players took off their helmets before the fight. The first goal came at 8:01 in the first period scored by James van Riemsdyk, a wrist shot assisted by Phil Kessel and Colin Franson. But we fought back and two minutes later, 10:08 into the first, Lars Eller buries a wrist shot past James Reimer to tie the game at 1! Eller was assisted by Raphael Diaz, who had a decent game with 3 shots on goal, and Alex Galchenyuk, who played great and assisted his close friend Brendan Gallagher 3:46 later. That wrist shot, also assisted by first goal scorer Lars Eller, put the Canadiens up by 1. That finished off the first period for scoring, and the Canadiens had many great chances and truly had the Leafs in a choke hold . This forward momentum for the Habs continued to escalate except Toronto slowly started getting its game back, laying more shots on the well performed Price and getting great chances, until the captain Phaneuf came through with a great set-up wrist shot that plain beat the goaltender. Then what truly grapped the momentum out of the Canadiens reach was a short-handed goal scored with a single-handed effort by Tyler Bozak, making the score 3-2. From there the period would end, just for newly aquired Mason Raymond to come through with yet again another wrist shot 5:10 into the final period. The period would not have much action in it until with 2:22 remaining in the game, Lars Eller has a great effort and scores to put the Habs within one. That goal was a great play, chip the puck up the boards, chase after it. cut from the side into the center and get close to the goalie without touching him, then he buried it weak side. That goal makes for his 2nd of the night, this time unassisted. Les Canadiens would keep up the pressure and pull Carey Price with just over 50 seconds remaining, just to come up short. Although in the last 2 minutes they gathered many, opportune chances, it would not be enough to get at least 1 point and force overtime. There were many penalties in the game, almost too many for me to count. A total of 100, 43 to Toronto and 53 for Montreal. Many unsportsmanlike conducts, and a not well fought out game sportsmanship wise. I believe if we had take the game more seriously and pushed the rivalry aside, it would've been an easy win, my thought is 4-2 final score, in favor of the Canadiens. But then again, this is a heated rivalry and there's gonna be high tensions no matter what when these two teams play. We scratched Nathan Beaulieu, Ryan White, and Michael Bornival, while the Leafs scratched David Clarkson and Morgan Reilly. Toronto went 1/7 on the power play, while we went 0/4, which obviously shows that there is much improvement needed to be done there, especially because Toronto buried 1 short handed on us. Toronto led us in hits 25-21, faceoff wins 29-26, and blocked shots 19-17. I personally am satisfied with the amount of hits and physicality we've stepped up in our game, and 17 blocked shots is a big number so that shows a growing strength in defense within our defensive zone, and protecting our net. That is great because that is something we lacked last season. I am very happy to see that many players have stepped up as faceoff specialists, something that we lacked last season and possibly is a major reason why we suffered late into the season. But 10 giveaways is not a number that I like either. Toronto only had 5 in that category, and if we give the puck away too much then that's basically giving them chances to capitalize on us. But what somewhat makes up for that is 7 takeaways compared to Toronto's 3. That demonstrates a high greediness and hunger for the puck, and it shows that we are making necessary plays to disable their chances and play to create some offense plays and chances of our own. All in all, it was a well fought game yet at some points we lost our steam, we really turned it on in the last 2 minutes, and if we played with that same intensity in every game we have Stanley Cup potential.